Anne-Sofie Tholander: The joy of using fresh yeast! The joy of using fresh yeast! 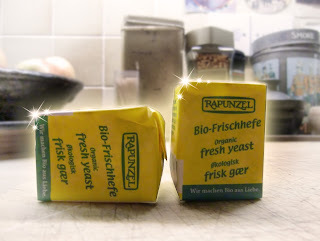 This weekend i finally managed to find fresh yeast. It is super expensive compared to the good old normal yeast from Denmark but nevertheless.. it is yeast! (and organic too) I found it in a small organic health store where everything was quite expensive. It was almost like being back in Denmark and the yeast packs even have writing in danish on them. I bought 3 packs and they cost £1.09 each however i do not mind paying that price because it is worth my joy of using yeast. I never thought i would crave using yeast as much as i have.